Screenshot: NBC/Paramount Pictures, Graphic: Nicole Antonuccio. Jacqui beat me to it: Considering it’s a critically respected cable series starring an iconoclast comedian, Baskets has a shocking amount of product integration, topping even the most branded web video. What other show has three supporting characters who work for sponsor companies? Jacqui mentioned how much Christine Baskets loves Costco—Louie Anderson’s matriarch talks about it all the time—but Martha Kelly’s character also works there. Christine’s boyfriend Ken (Alex Morris) works for Stainmaster in the show, and in the credits for his early episodes, Stainmaster is a sponsor. Ditto Arby’s, which employs a couple of Chip’s friends—a recent episode even had Chip’s Juggalo pal Jode extolling the restaurant’s generous maternity benefits. It feels more pronounced and distracting in season three. In the recent episode “Thanksgiving,” Chip’s friend opens Arby’s after hours so Chip, Christine, and his friends can enjoy a belated holiday meal together. “Take a deep breath!” Christine says as she walks through the door. “I’m home!” The very next line is “Welcome to Arby’s.” It’s a bit much. How did J&B become the official hooch of giallo, the Italian pulp genre of swinging murder mysteries and proto-slashers? The value-priced, entry-level blended scotch whisky’s highly recognizable bottles—green glass, red screw cap, yellow label with huge red letters—are as common a sight in classic ’60s and ’70s giallo movies as black-gloved killers and shag, to the point that I’d call them an essential ingredient in the genre cocktail. (There’s even a bottle in Dressed To Kill, Brian De Palma’s giallo-est movie.) But they also pop up in poliziotteschi cop flicks, horror movies, and sleaze items, leading one film academic to call J&B “the most plugged product in the history of European cinema.” The backstory is murky; genre filmmakers of the time were audacious copycats, and it’s likely that some savvy marketing by a local distributor (and an association with the glamorous Italian-Americans of the Rat Pack) led to the brand’s bizarrely glitzy placement in Italian films, which are probably the only places you’ll find anyone drinking it neat. You don’t see product placement in video games much these days, and when you do, it’s relatively subtle. But back in the mid-to-late ’00s, the industry was going through a rash of brutally intrusive in-game ads, the most absurd—and therefore best—of which had to be in EA’s Fight Night Round 3 boxing game. EA’s drive to make its sports games look like an authentic broadcast has always given the company a “reasonable” out for bringing ads into them, but the third Fight Night game reached a new level. You boxed in arenas plastered with screens shilling for Staples and banners telling you to Have It Your Way. And although the camera was always tightly focused on you and your opponent, the rings were so thoroughly covered in logos that they were never out of view. What put it over the top and brought it from obnoxious to charmingly ridiculous, though, was the inclusion of the Burger King as a trainer who’d accompany you to the ring in all his grinning, giant-headed glory. Vince Staples does not make particularly funny music, but as a public figure—in interviews, on Twitter, and so on—he is one of the sharpest-witted figures in pop culture, always quietly chuckling at a joke that you’re not in on. Ever since he caught the beat on his breakthrough “Norf Norf” with a memorable Sprite namedrop, he’s embarked upon a fruitful partnership with the brand that often feels like a postmodern performance piece. A content strategy trade pub called him “the most interesting influencer in the world” thanks to tweets like “We taking off you guys have a good day & remember to pay your taxes it is very important shoutout Sprite,” as well as “Sprite is vegan.” He seems to enjoy sardonically playing the part of a spokesperson but also seems to genuinely love Sprite, putting on a promo concert, gamely showing up for this much more Staplesque spot, even letting the damn soft drink sponsor a video from his new record. Come at him on Twitter for selling out and he’ll respond, “I can’t hear your negativity over the lemons & the limes.” There does not seem to be any explanation for any of this besides the fact that he really, really likes Sprite. I mean, Sprite is pretty good, now that I think about it. RuPaul’s Drag Race sends up the shameless product placement on other reality competition shows—looking at you, Project Runway—with a wink and a heavily lipsticked smile. There’s Absolut Vodka’s appearance in the bright pink cocktails the contestants sip at the end of every episodes, of course, as well as dating app Scruff’s sponsorship of the nearly naked “Pit Crew” and Ru’s deadpan, direct-to-camera delivery announcing such quality online realtors as silicone breastplate maker BoobsForQueens.com. But the most arch of these product placements has to be the traditional “Tic Tac lunch” where each of the final four contestants sit down with RuPaul for a “meal” of a single Tic Tac—usually raw, but sometimes blended into a “smoothie”—in the penultimate episode, a high-camp commentary on the absurdity of feminine beauty standards in a colorful, candy-coated package. The path to Baskets’ Dada cult of Kirkland runs through a decade of knowing, single-cam-sitcom winks to the likes of Snapple, Subway, and Burger King, which in turn have their own, bite-and-smile antecedent: The scene in which Wayne Campbell and Benjamin Oliver negotiate Noah Vanderhoff’s appearance on Wayne’s World, an anti-commercial spiel in which every cut kicks off a new commercial. It’s a precision-crafted piece of satire, each of Wayne’s transparent pitches escalating to that glorious shot of Dana Carvey, looking to all the world like he was just hurled upon by a Reebok outlet. The smartest jokes in one of the all-time smart-stupid comedies are all the sharper considering when they were being made: In 1992, when the concept of selling out still had a significant amount of stink on it. 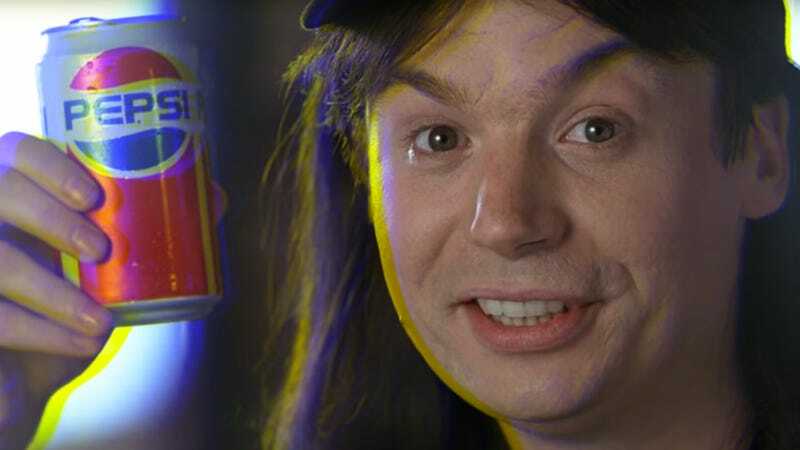 At a time when a band could lose a chunk of its audience for so much as thinking about signing to a major label, Mike Myers’ Pepsi-swigging grin was a bold choice. And it was the choice of a new generation. Like Erik, I’ve always preferred my product placement flavored with a healthy portion of the hand that feeds. Sure, I’m still being pitched to, but at least I’m confident that everyone involved knows how stupid advertising’s hold on our dumb human brains actually is. In fact, I’m not even sure if my favorite corporate integration gag—from a second-season episode of American Dad—got the show any money. The clip in question, which sees father-son team Stan and Steve Smith duck, apropos of nothing, into a friendly Burger King to do some National Treasure-esque map sleuthing, might just be there for the joy of the joke. Either way, it’s a gag that I’ve never been able to get out of my brain, as Seth MacFarlane (still a top-notch voice actor, for all his other faults) grimaces out a strained “Have it… your… way” for his corporate overlords’ delight. The comedian Ernie Kovacs was an avid cigar smoker to the point where, somewhat gruesomely, it was reported an unlit stogie was found inches from his hand at the scene of the car crash that killed him. He leveraged his fondness for cigars into a deal with Dutch Masters to advertise on much of his television work. Kovacs claimed the benefit of working with Dutch Masters came from the freedom to write and produce the commercials completely without their interference. While that’s certainly not entirely true, Kovacs’ Dutch Masters ads remain some of the funnier and spontaneous commercials you can find. Tonally, they bear a lot in common with Jim Henson’s famous ads for Wilkins coffee. Both have the same anarchic, cartoon energy and while Kovacs’ Dutch Masters spots may not be as reliably violent as the Wilkins spots, he wasn’t opposed to doing a Wild West bit where a defeated gunslinger takes a puff from his cigar, only for multiple plumes of smoke to emerge from his bullet-riddled body. Many of the references people are citing here are enduring examples of advertising that double as critiques of same. But in recent history, one product integration has stood out to me as being extra-delightful in how it manages to perfectly worm its way into the preexisting story: That would be the use of Zima on Marvel’s Agents Of S.H.I.E.L.D. New character Deke has just traveled through time to the present day, having spent his entire life until now in the future, as a prisoner on a space outpost after the planet was destroyed, and has never known any real nature, food, or drink. So when he enters a bar for the first time, mere minutes after his arrival, he orders a beer with a sense of heady excitement, only to discover the bitter taste. Recoiling, he asks, “Do you have anything else that’s like this, but delicious?” At which points the bartender cracks open a bottle of Zima and sets it in front of Deke. He sips it, a wide smile spreads over his face, and we’re treated to a effervescent montage of Deke getting drunk on Zima. It’s such an honest moment, because that’s exactly what kids do when they start trying alcohol for the first time—find the sweetest, most agreeable concoctions imaginable. I remember doing it myself, slugging Zimas behind a garage with friends in sophomore year of high school, wondering why anyone would subject themselves to the taste of beer. So to watch someone literally having their first drink, only to go straight for the Zima, rang painfully, hilariously true. What&apos;s something from science-fiction that you wish really existed?